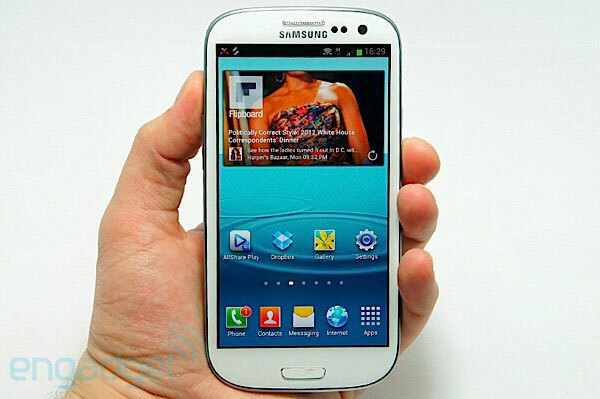 Samsung has officially launched the Galaxy S III, the successor to the company’s most popular handset, the Galaxy S II. With class-leading tech specs and a raft of impressive new software features, the Galaxy S 3 will undoubtedly be the iPhone’s biggest competitor when it hits stores later this month. The Samsung Galaxy S III has a blazingly fast 1.4GHz quad-core processor, massive 4.7″ high-definition AMOLED display, forward-facing 1.9MP camera, rear-facing 8MP camera with 1080p video recording, 1GB of RAM, microSD, microUSB and 4G LTE connectivity. Like the iPhone 4S, the Galaxy S III will come in 16, 32 and 64 GB capacities. The screen is impressive, but despite a screen resolution of 1280 x 720 pixels, and 306 DPI – individual pixels are still visible due to sub-pixel sharing. The Galaxy S III doesn’t depart far from previous Galaxy models, with the S III more a design evolution than revolution. 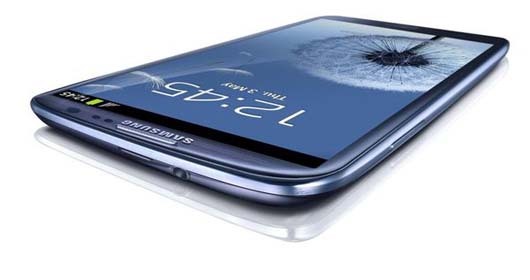 The S III measures in at 136 by 70 millimeters, which is considerably larger than the iPhone 4S (115 by 58 mm), but the new Galaxy is also thinner than the 4S by 0.7 mm. Despite the size, the Galaxy S III weighs in at a very manageable 133g. The S III retains the physical home button and features a glossy plastic front and rear, available in two colors – Pebble Blue and Marble White. The removable plastic back-plate reveals a 2100 mAh removable battery. The Galaxy S 3 will be the flagship smartphone for Android, and will feature TouchWiz overlaid on the Android 4.0.4 Ice Cream Sandwich operating system. Samsung have announced a number of new software additions on the Galaxy S III, including “Smart Stay” which keeps the display turned on by utilizing the front-facing camera to detect your face while using the phone – doing away with the need to continually touch the device to prevent the screen from going to ‘sleep’. “Smart Alert” is a new feature which displays missed notifications such as new calls, texts or emails on the screen when activated by the accelerometer (i.e. picking up the device). Users will be able to take advantage of new voice activation software, “S Voice”, to interact with the Galaxy S III. The new feature will enable users to unlock the device, take photos, snooze alarms, increase music volume and more with simple voice commands.